At Nu Flow Midwest we are often asked these questions before and during the pipelining process. Below we outline frequently asked questions we have received during epoxy pipe restoration at a facility or multi-property building. If you have any further questions, we would love to answer them! Head over to our contact us page and send us a message, we would love to hear from you. Will my water be shut off during the pipe lining process? A single riser can take up to 5 weeks to line. At Nu Flow, we want occupants of a building to be comfortable during this time. For this reason, we only line one hot or cold water riser at a time. This allows us to install mixing valves so that certain areas have water during the pipelining process, like sinks, showers and toilets. Will my epoxy lined pipes ever experience problems? Epoxy lined plumbing pipes rarely experience problems. However, if problems are going to occur, it’s usually during the installation process. For example, not getting the pipe clean all the way down to the pipe wall can result in the epoxy liner or coating failing to adhere properly to the host pipe. This is why we have a rigorous cleaning process before we line a plumbing pipe. Once the epoxy liner is in place and cured, there’s really nothing that’s going to break it apart. This is because once the epoxy has cured, it’s extremely hard and durable. Will my epoxy lined pipe need additional maintenance? 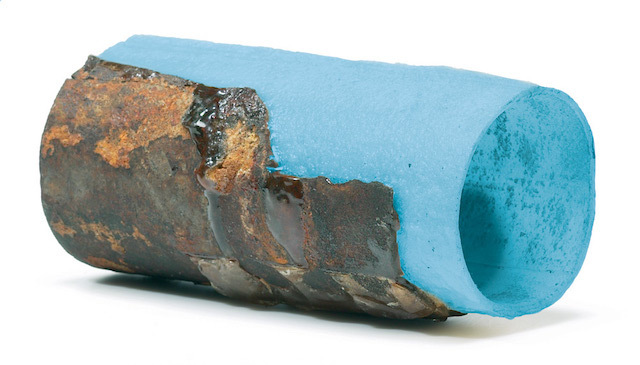 Once your pipes are lined, your risk for experiencing future corrosion is eliminated. Since the water can’t interact with the host pipe due to the epoxy liner, there is no risk of further pipe corrosion or buildup. Will my drain lines still need to be hydrojetted after pipelining? If you regularly have your drain lines hydrojetted, you can still hydrojet your drain and sewer lines. However, for the lined sections of your pipes, you won’t need to clean them as often. Instead, what you are really cleaning are the unlined sections of your drain pipes if you didn’t have all your drain pipes lined. Should I be worried about epoxy chemicals leaching into my water? The epoxy used by Nu Flow does not leach chemicals into the drinking water, and it doesn’t deposit chemicals into wastewater. This means that epoxy liners are environmentally friendly and will not pollute nearby waterways, creeks or streams if that water happens to leave the municipal plumbing system. Is the pipelining process noisy? Our team takes steps to minimize noise in your facility or building by keeping our air compressors outside the building. Building occupants may hear the sound of air running through the air compressor hose. Is the pipelining process dusty or smelly? Our hose system is a closed loop; meaning that there are no open hose ends that can pump dust into the air or allow odors into the indoor air. Instead, all dust, dirt and debris remains in the hoses and are collected in special collection bins. Our team installs filters which serve as an extra precaution so that large amounts of dust and/or odors are not released into your indoor air. Is my water safe to drink after the pipelining process? We perform water tests both before and after the pipelining process, and we submit those results to the management staff, employees and residents of the building or facility as well as the city and state authorities. This is done in order to prove that the water coming out of your pipes after the lining process is the same quality as it was before the lining process. How many plumbing risers are lined at one time? Our technicians line one riser at a time. That plumbing riser is isolated from the plumbing system while it is being dried, cleaned and lined. This means that only the units connected to that riser will be affected by the pipelining process. How long has Nu Flow been in business in Chicago? Nu Flow, serving Chicago and the greater Chicago area, has been lining pipes since 2012. We are authorized to work on indoor and outdoor plumbing pipes in the state of Illinois and Chicago, and we have a licensed plumber on staff to ensure that the pipelining process goes as smoothly as possible. How long can I expect my lined pipes to last? Epoxy lined pipes can last anywhere from 30 to 50 years. How long are your pipelining technicians on site each day? Our pipelining technicians typically start arriving between 6AM and 7AM, and they leave the property around 4PM. At arrival they inspect, check and connect equipment to your plumbing pipes. If you are multi-property building, our pipelining technicians do not typically start entering tenant occupied units until 8AM. How do you ensure the epoxy liners are properly cured and in place? We use a digital camera to view the inside of the pipe; this allows us to view the final product and ensure that it has properly cured and is in the correct place. Water service is only restored after the final camera inspection has been completed and no installation errors were found. How do I know that the epoxy coating/liner lined the entire pipe evenly? Epoxy coatings are mixed to a specific consistency in order to ensure that the epoxy rolls over itself as it evenly coats your plumbing pipes. Once the coating process is complete, we perform a camera inspection to ensure that the liner was installed correctly and that no section of the host pipe is visible through the liner. Do you offer a warranty on the lined pipes? We offer a 10-year warranty on parts and labor. That means that if anything goes wrong with your lined pipes, we will come out and repair them free of charge. Are plumbings pipes lined all the way to the shutoff valves? Potable Water Pipes: These are lined all the way to the shutoff valves under sinks and toilets. Risers: During this process our technicians cut the pipes under sinks and toilets in order to connect the hoses. Once the pipes are lined and cured, a new shutoff valve is installed on the cut pipes. Many unit owners and tenants find this to be extremely helpful when performing future repair and replacement work on their water fixtures because they can shut the water off to the toilet or sink without affecting the rest of the units connected to the riser.